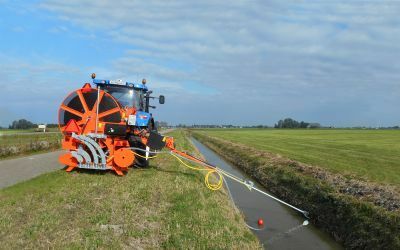 In collaboration with machine manufacturer Widontec in Veghel Homburg Holland has developed a self-propelled sprayer: the Homburg HeroW. This completely new self-propelled machine is a response to demand from vegetable growers, farmers, nurseries and contractors generally for compact, manoeuvrable self-propelled sprayers that offer generous ground clearance, maximum visibility and all this at a competitive price. The HeroW H430 is the next logical step to follow on from its earlier successful introduction, particularly with regard to market gardeners and arable farmers who set higher standards for capacity, handling, comfort and tyre configuration. Moreover, the HeroW H430 complies with the latest standards for exhaust emissions. The HeroW H430 can be supplied in two axle widths of 1,500 and 1,800 mm, which can be adjusted hydraulically as standard to 1,800 or 2,250 mm. The H4 series makes it possible to achieve a maximum driving speed of 45 km/h. Profitability - Greater ease of use, manoeuvrability, visibility and spraying result all mean a healthier bank balance. Homburg HeroW is fitted with a hydropneumatically sprung front axle with Automatic Suspension Control (ASC). Depending on the front axle loading the ASC ensures optimal road stability. This means that the boom remains at the correct height both with a full tank or an empty tank. The booms are suspended with two spiral springs ensuring stable support in the field and when transported on the road. Simplicity and reliability are maintained with this suspension principle, which offers very natural and optimal movement over obstacles. It allows an excellent follow-up of the soil contours for optimum traction and increases the operator’s comfort. The EasyDrive system ensures that the vehicle can be driven with maximum ease, both in the field and on the road. EasyDrive optimises the capacities of the transmission and the engine. Various functions while driving such as engine speed and rpm regulation, acceleration and operating/road transport modes are readily programmable. Illustration below: Deutz engine showing in-line hydraulic pumps for travel drive, air assistance (HARDI TwinForce) and water pump drive, respectively. Homburg can be equipped with a foam marker and/or GPS.